On Ferguson and Related Events: How Should Historic Sites Respond? 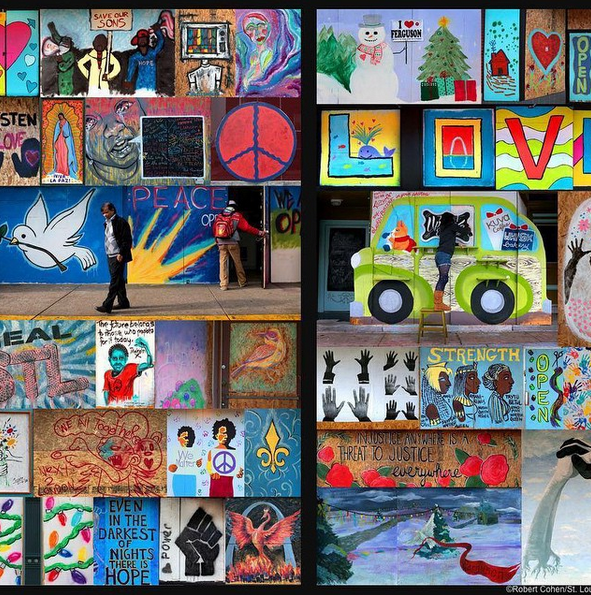 Storefronts that were covered with plywood during the protests in Ferguson were painted by local artists and collected by the Missouri History Museum. Ferguson and related events are sparking broad protests over the treatment of African Americans by the police and the courts. Should museums and historic sites be involved? Should they be collecting, preserving, or interpreting these present-day events? Should they provide a place for protest or response? Or are these beyond their roles and responsibilities? There are no easy answers because every site and every community is different, but ultimately, people engage with historic places because there’s a personal connection–historic sites are collecting, preserving, or interpreting topics that are relevant and meaningful to the visitor. Identifying what is relevant and meaningful isn’t always easy but contemporary events offer a glimpse. People discuss, explore, study, question, react to, and protest about issues that matter to them, and the more people that are involved around the same issue, the more significant it is. Museums and historic sites inhabit a special “third space” in society that allows us to do things that can’t happen at home or work. They allow diverse people to discuss, explore, study, question, react to, and protest about issues in a safe place. As Presence of the Past has shown, we are trusted by the public because we consider all perspectives and we rely on authentic sources. Several museum bloggers have been moved by Ferguson and related events to develop a joint statement to the staff and boards of museums and museum associations about the role of museums in society. If Ferguson isn’t relevant to your historic site or your community, I urge you to develop some programs and activities around another contemporary event that is important and meaningful to your community so that are you become increasingly engaging and relevant. It isn’t always easy and requires taking risks, but as we’ve seen at places such as Cliveden and the Harriet Beecher Stowe Center, the investment can result in greater dividends. We invite you to join us in amplifying this statement. As of now, only the Association of African American Museums has issued a formal statement about the larger issues related to Ferguson, Cleveland, and Staten Island. We believe that the silence of other museum organizations sends a message that these issues are the concern only of African Americans and African American Museums. We know that this is not the case. We are seeing in a variety of media—blogs, public statements, and conversations on Twitter and Facebook—that colleagues of all racial and ethnic backgrounds are concerned and are seeking guidance and dialogue in understanding the role of museums regarding these troubling events. We hope that organizations such as the American Alliance of Museums; the Association of Science-Technology Centers; the Association of Children’s Museums; the American Association for State and Local History and others, will join us in acknowledging the connections between our institutions and the social justice issues highlighted by Ferguson and related events. This entry was posted in Community engagement, Cultural diversity, Governance and management, Historical interpretation, History and tagged Ferguson on December 11, 2014 by Max van Balgooy. I don’t necessarily see the relevance to house museums, but all local history museums should be actively collecting materials relating to local protest. One of the problems in not having a full blown local history museum in DC is that there is not systematic collection of materials relating to protest in Washington. Note that right now at the Museum of the City of New York there is an incredible long term exhibit on protest that I think is an exemplary model of presenting an exhibit on protest covering both historical and contemporary issues. I am not sure what kinds of programs are organized around the exhibit, if there are any, which could be an incredibly rich programming opportunity. And I think (I haven’t been to it since it reopened) that the Richmond Valentine History Center does a great job of presenting the historical timeline/thematic approach to Richmond’s history that creates a context for addressing contemporary problems. Thanks, Richard! Great suggestions of history museums that are connecting past and present. It’s mentioned in the second cited piece, but one of the most amazing “public art” installations I’ve ever seen put on by a government in the US is the art treatment that it is part of the Exposition Center transit station in Portland. Japanese gates are used to honor the Japanese-Americans interned there during WWII. Within the gate columns are plate imprints of front pages of the local newspapers of the times, and their virulently racist headlines. This is another example of agencies creatively addressing social issues with contemporary relevance. One more thing. I was thinking of this past post for different reasons, and it’s really two entries in one, but the last half of the post is about public space, contestation, and promoting engagement on local issues. One of the photos shows a portable exhibit (that we saw at a local farmers market) by the Montreal Eco Museum (about sustainability). Readers may be interested in the upcoming Twitter chat on the topic: Should museums engage in social justice? How should museums advocate? #museumsrespondtoferguson chat Wednesday, December 17, 1-2PM CST. Aleia Brown and Adrianne Russell moderated the Twitter chat on #MuseumsRespondToFerguson and the conversation is available at Storify at https://storify.com/aleiabrown/museumsrespondtoferguson. Because of the overwhelming response, Adrianne and Aleia will continue a monthly Twitter chat with museums on community engagement and grappling with race and police brutality (every third Wednesday from 1-2 pm Central).